Food is center stage in my home quite often. The kitchen is truly the heart of our family home, and I love hanging out there. When I say that food is important to my family, I don’t mean constantly eating junk laden food. 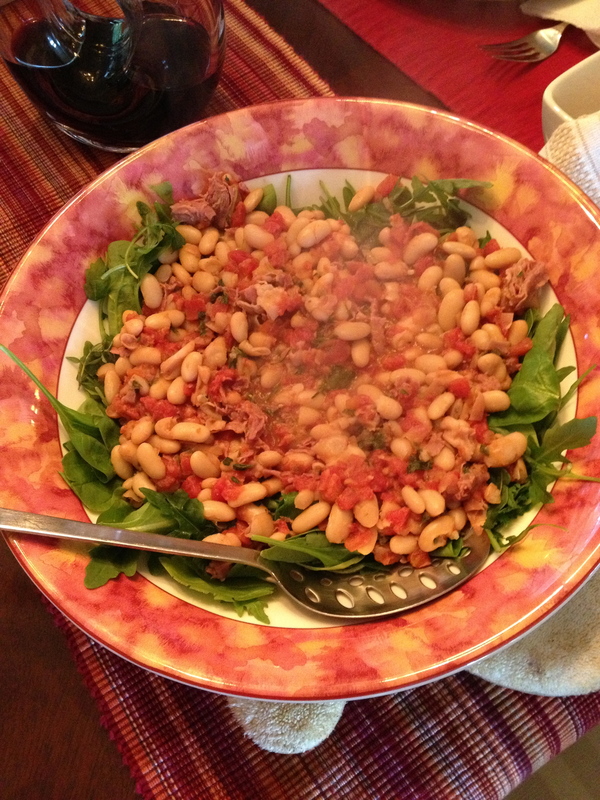 Taking the time to prepare food with family is enormously rewarding. It is a family value and time well spent together in a warm comfortable accepting environment. My children have always felt welcome inviting their friends over for meals. My youngest son recently said “mom, my friends asked me what my mom would do if you told her 30 friends were coming over. I told them that you would say…Are they staying for dinner?”. He said it in a matter of fact way. He meant it. And he was right! That is the true heart, the essence of my home for which I am truly grateful. My children’s friends are welcome, and they know it. My friends too. I love a home filled with friends, family, food and fun! We have great meals and nutritious food, but we have loads of fun too. I enjoy cooking, but am not much of a baker. I can sure improvise though. And have a blast. My kids do too! I love to cook, but the teeny tiny side of me that bakes rears its ugly head every now and again. 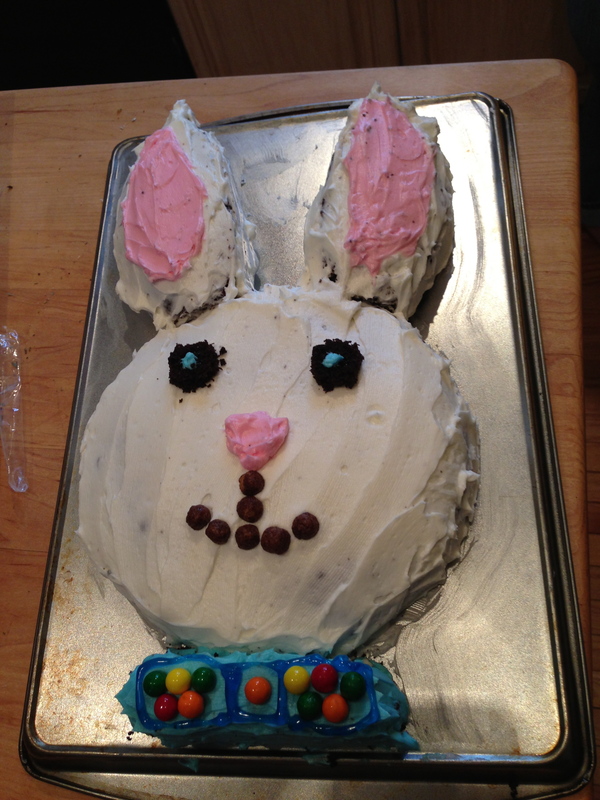 Not really one for cookies, I turn to making cakes with the children. We put a spin on it though. We will make fun cakes for most any occasion! 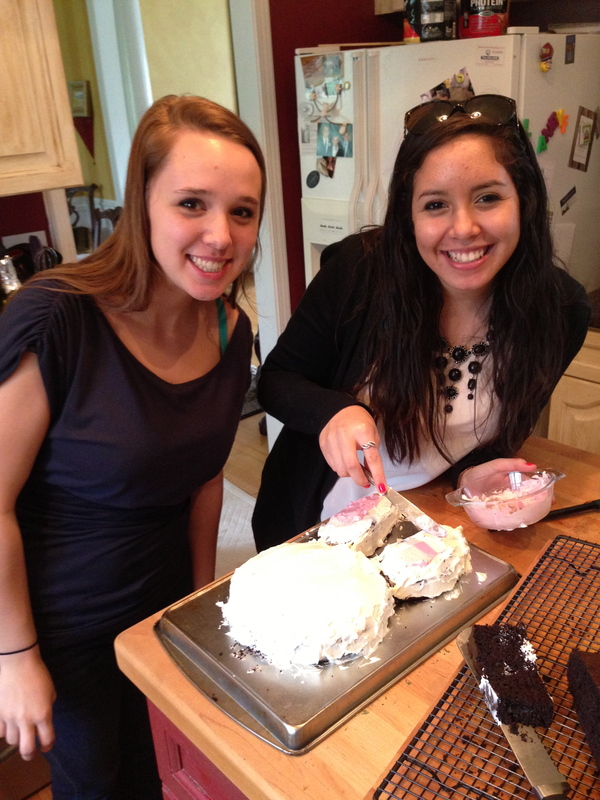 My daughter Delaney and her friends Lorena making the traditional “Bunny Cake” for Easter! So Fun! When we make cakes, we use a high quality cake mix. Those work just fine for non bakers like myself. But I always make the frosting from scratch. I learned how to make out of this world frosting from my mom. She very wisely advised me to “always make a little too much frosting by accident”. Was she ever right! 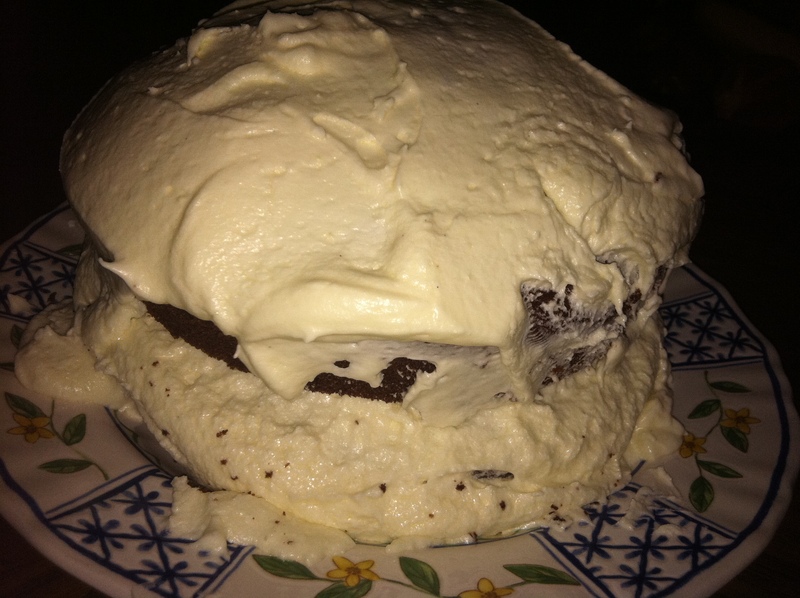 I was never voted Prom Queen, but when I make frosting I am Prom Queen for a moment..the most popular girl ever! What do I mean by popular? Let me tell you! When I bust out my frosting, a line forms in the kitchen. Kids. Denis. His mom. Everyone lines up to grab a spoonful of frosting before it makes its way to the cake. Everyone but my youngest son that is. The baby of the family (I am one too!) is a scrappy bunch. We learn survival of the fittest at a very young age! Anywhooo, my son doesn’t grab a spoon and stand in line. Nope, not him. The moment he notices a naked cake cooling on the counter and a stick of butter nearby softening, he loudly “calls the beater”. Now that is the holy grail when making frosting, let me tell you! He is a smart kid. No line, no waiting, and a solid guarantee of a good dose of moms incredible buttercream frosting. Yup, that’s my boy! But I digress! Back to the cakes. I do not have lots of room in my kitchen for a bunch of specialty cake pans. So I improvise. I make 2 round cakes, or a round cake and a square one, and cut it to fit the occasion. I have also made a rectangle cake for my sons, and with colored frosting made everything from a football field cake with action figures to a construction site cake with matchbox bulldozers. So much fun, and the creativity flows. Food should be fun, so go have a blast! 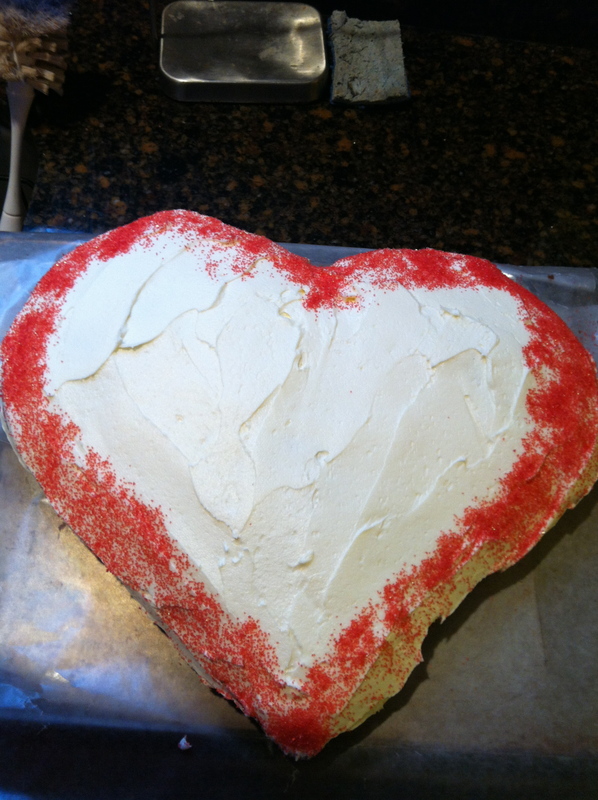 Our heart cake for Valentines Day.